Traveling. What a fantastic experience!! Who doesn’t love to get away from home, explore new places or relax by the pool or beach somewhere? Whatever your destination of choice, whether for adventure or relaxation, vacations are always a nice change from the everyday. I have said it before. The iPad is a great travel companion. To make it an ideal travel companion why not load it with Travel related Apps? Today I’m going to be discussing 5 free travel Apps that will help you get the most out of your next traveling adventure! Most of these travel Apps need to be connected to the Internet to access the latest travel information and updates. Kayak allows you to search for flights, review and book hotels or simply explore destinations filtering by activities or temperature. The App is very intuitive and easy to use. 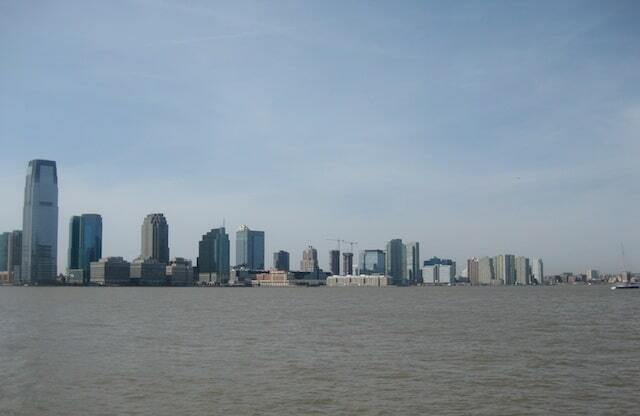 The filters are straightforward and increase the chances of finding a flight or hotel with the right characteristics. 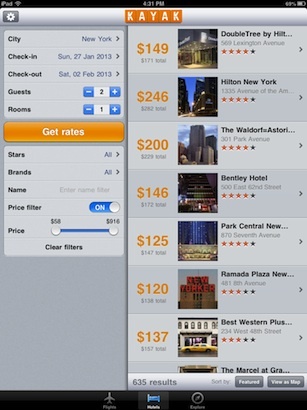 When reviewing hotels, I liked the fact that you can browse the hotel pictures right within the App. 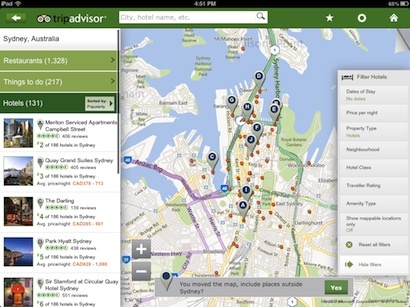 TripAdvisor lets you browse reviews of other travelers for hotels, restaurants and things to do. You can save hotels and restaurants to your favorites and see those favorites on other devices if you are signed in to your TripAdvisor account. You can also search for flights. Download travel guides for different countries onto your iPad and review the guides while offline. Check maps, add bookmarks for the places you want to keep handy, review sightseeing, eating out, night life, hotels and day trips information. Triposo let’s you write a simple travel log (travel diary) where you can document your travel experience with location information, pictures and text. Pack the bag lets you prepare packing lists for your trips. The App is very intuitive and easy to use. You start by selecting the categories that are related to your trip and then the items within those categories. Once the list is ready, you can use it as a checklist while packing your bag. Your checklists can be edited and reused as needed. Pack the Bag lets you send your checklists by email in table format. You can also export your list using Dropbox. 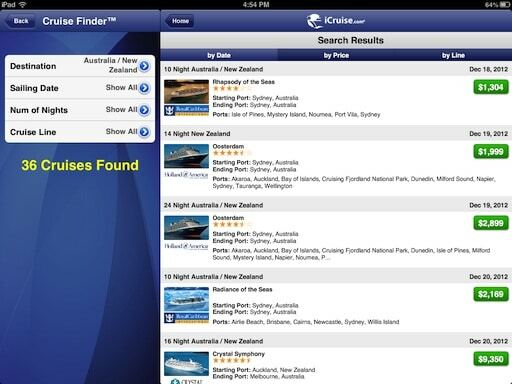 Cruise Finder lets you search cruises by Destination, Date, Departure Port, Cruise Lines, Cruise Type and Cruise Ships. You can save cruises to your favourites and book cruises (if you are a US resident). You can see the deck plans, staterooms and suite pictures as well as ship specifications before booking any cruise. If you are traveling anytime soon, you may want to check out the Translation Apps and iPad Camera posts. Which Travel App do you like the most? Let me know by posting a comment using the form below.